Solascren Lotion: Each bottle contains 60 ml lotion of Padimate O USP 8%, Avobenzone USP 2%, Oxybenzone USP 3% and Titanium dioxide BP 2%. Solascren lotion is a non-greasy, water resistant, protective sun block, which helps prevent sunburn in all types of skin. It provides a high degree of protection against the harmful effects of ultraviolet components of sunlight which are responsible for skin cancer, wrinkling, premature ageing and darkening of the skin due to overexposure. Solascren provides a sun protection factor (SPF) of 6 against UVA rays and 28 against UVB rays. The SPF describes how much longer you can remain in the sun without being affected by these rays, compared with unprotected skin. Solascren gives you 28 times your natural sunburn protection and maintains its degree of protection up to 60 minutes in water. 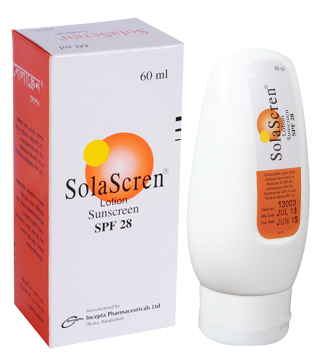 Solascren lotion should be applied carefully and evenly on skin before sun exposure. Apply 45 minutes before swimming or sweat producing exercise. A single application may give day-long protection but the product should be re-applied during prolonged periods of sunning and after swimming or excessive sweating. Signs of irritations (including erythema, burning or rash) may appear when applied to sensitive or broken skin. Application to broken skin should be avoided. Contact with the eyes and other mucous membranes should be avoided. Solascren lotion should only be used if the anticipated benefits outweigh the risks.